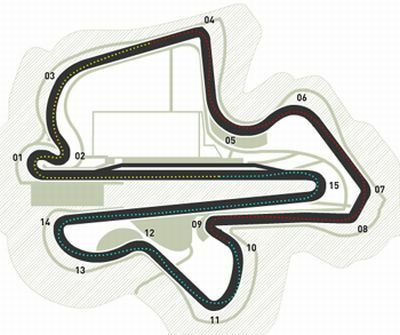 Despite conversations with my team and multiple attempts in the simulator back at the factory, I still barely know this Malaysian circuit so I’m a bit hesitant to go out today. But go out I must and being Practice, now is as good a time as any to learn the circuit and get as many laps as possible under my belt before the race on Sunday. With the clock about to start, I think I’ll go out as soon as possible. Well, that wasn’t so bad. The track was pretty damn easy to learn -- a pleasant surprise -- and despite a few moments, I’m happy overall with that session. 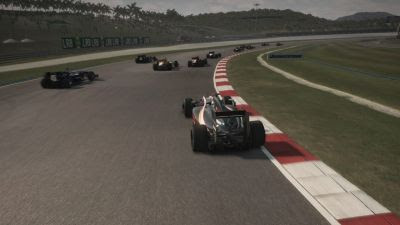 As I expected it wasn’t too long until my first small moment, occurring in my first run as I went wide and spun as I accelerated out of the final, extremely tight turn on my second proper lap. It wasn’t anything drastic though and I was able to press on with no harm done. Some of the apexes of these corners are hard to spot, despite not necessarily being blind or sneaking up on you. They’re just awkwardly cambered, or happen in quick succession after an initial corner. It’s not a problem and my confidence to push them over the weekend will grow, but it’s an interesting point nonetheless. 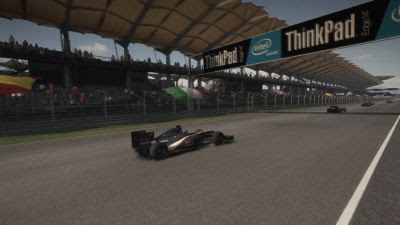 My second attempt at the Malaysian circuit was better, my times improving a little but still nowhere near those of my rivals. I also had another small spin, this time during turn 1 and once again due to accelerating slightly too early. Alguersuari, who wasn’t far behind me, collected me gently as he mustn’t have seen me spin. Nothing significant, the spin was simple (and perhaps unnecessary) and the contact was minor. I’ll get the hang of this track yet. Pit lane was my enemy on my third run, receiving a warning for illegal blocking as I exited to begin the run and then coming back to return to the pits I spun on the bumpy entrance, clearly entering a little too fast. The spin was once again minor whilst the warning… well, I thought it was a bit unfair. The pit lane exit is short and feeds you into the first corner almost instantly; of course I’m going to get in the way if I’m coming out and someone is about to enter the corner, as we both need to make it and therefore I can’t just drive straight on and off into the grass, just to ensure I’m out of the way. I accepted the warning as I’m still new and I just wanted to get on with my session. The rest of the run was good, the track finally making its mark on my physical and mental memory. The fourth run also included a silly spin, again in turn 1 on my third proper lap. It was nothing to worry about but summarized the lap overall which was scruffy and definitely could have been better. I also started to push a little more as I felt more confident and with basic track knowledge out of the way, I could start pushing the limits and find the ideal points to brake, turn and accelerate. My fifth run was busy, exiting into a gaggle of cars which meant that it took a while to get focused as I struggled to find some space on the circuit. Thankfully there were no spins or any other issues to worry about and I was able to get some good, clean and fast laps in. I also noticed it was getting significantly overcast. I decided to go with the Option tires for my sixth run, thinking it was time to start going for even faster lap times. I regretted this decision almost instantly however as it began to drizzle as soon as I left the pits. Interestingly though, my tires didn’t seem to mind and the grip levels remained consistent despite the rain. Because of this, I pressed on anyway and, perhaps ironically, started to set my fastest times yet. Hey, whatever works, right? Staying on the racing line -- which was still quite dry -- meant that there were no problems with the weather, but it did affect the ability to use the Option tires to their full potential so while I set my fastest times yet, they weren’t the best that were possible. Unfortunately I got blocked a couple of times on two of my flying laps, so I chose to come in early and change to intermediate tires for my seventh run due to the rain getting progressively harder. I didn’t mind though, treating it as an opportunity to finally see how the inters handled generally as well as some nice, decent practice in the wet. It was surprising just how quickly the rain got heavier, though, and, perhaps more importantly, how little visibility there truly was; so much so that I decided to go with the full wet tires for the rest of the session. It’s remarkable really, both the Prime and Option tires give insane amounts of grip during dry conditions, allowing a lot of corners to pass by extremely quickly, but I think I’m more impressed with how the wets perform. That first lap on full wets was incredibly enlightening, the grip they offer in a track that was more like a river than an F1 circuit seeming impossible at first but rather satisfying as it went on. Obviously, my braking points and approaches to each corner changed in the conditions, effectively resetting everything I had learned just a few minutes earlier. Interestingly enough, everyone else seemed to stay in the pits when the rain was at its heaviest, so I took the opportunity and empty track to get some more practice in under wet conditions. It was a bit strange that my fellow rookies -- my teammate Lucas included -- didn’t elect to do the same. When you include the two previous races as well this session was my best yet, having only a few slight mistakes that were, I feel, rectified rather quickly and giving me my first taste of unpredictable conditions. I had fun learning the track and how to drive an F1 car in the wet, got my bearings around the Sepang circuit a lot faster than I expected to and most importantly, kept consistent throughout, gradually improving my times -- until the rain came at least. I reached 13th for the session, which isn’t bad for my first ever visit here, and despite some minor and perhaps expected spins, the session was a success. Turns 1 and 10 need some more work, though. A surprisingly dry start meant that it was back to using the Primes for my first run, the washed out racing line taking a few laps to start returning, leaving grip levels inconsistent and slightly uncomfortable. It also took a while for me to readjust to the dry conditions mentally, my braking points and turn in points having to be rediscovered. That was a little surprising, but nothing I haven’t dealt with before. My second and third runs were practically perfect with some really great, clean and consistent laps. No mistakes, fast speeds and times, and gradual improvement over Practice 1. It began to rain as soon as I noticed how dark the track was getting, however, remaining light at first but gradually increasing as the third run went on. Still no proper runs on the Options, then. Opting with the inters for my fourth run, I took the opportunity for even more practice in the rain but unfortunately lost control coming out of turn 2 due to hitting the slippery exit curb. I also nearly lost it again in the same place on the subsequent lap but managed to save it. 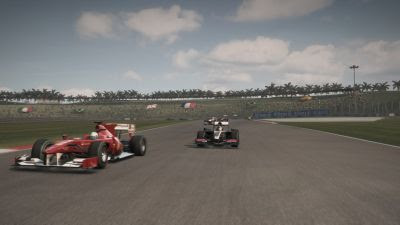 Finding myself behind one of my rivals, I purposefully followed them closely behind to get acquainted with just how poor visibility is whilst pursuing another car. The rain almost as heavy as this morning, I went with the wet tires for my fifth run, which was yet another good and consistent one. It’s amazing how concentration steps up another level in wet conditions, the intensity of driving in them even more incredible than my surprise in Bahrain. It wasn’t exhausting though, proving that I’m finally getting accustomed to what it is like to race in Formula 1. Continuing with wets, my sixth run was spoiled by some mishaps including a couple of half-spins. I was able to recover from both easily, and clearly they were as a result of the conditions, so I decided to drive a bit more cautiously afterwards. My seventh run featured a small spin but was otherwise yet more good practice, the rain seemingly decreasing but remaining steady. For the final run I went back to the inters, the rain only drizzling but the track still significantly wet. I once again took the opportunity to get some wet practice in, and couldn’t help but chuckle as I followed a funny battle for track position with Jenson Button, Robert Kubica and Jarno Trulli -- it’s not a race guys! (Yet…) I managed to finish 12th, one position higher than Practice 1, with a lap time of 1:38.455 which was set while the track was still dry. Overall I did 23 laps, and it was a great session with very few mistakes, more practice in the rain and more confidence with the Sepang circuit generally. Bodes well for tomorrow’s session and then, of course, Qualifying. Another great session, perhaps my best Practice to date! With no rain in sight the track seemed to be at its fastest, my first run yielding a time that was on par with the best seen in Practice 2 (a 1m, 38). 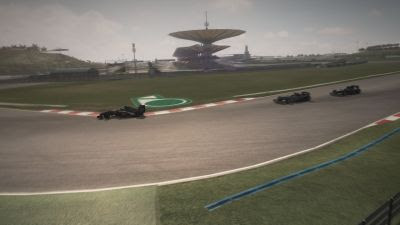 Also in this run I passed Webber who had spun at turn 10 and was facing the wrong way on my in-lap. On run 2 I noticed Webber had recovered to set the fastest time for the session, so the spin clearly didn’t affect his progress too much. My first flying lap for the run was aborted due to Bruno Senna spinning at turn 2, whilst my second flying lap was also aborted due to my own spin in turn 10, thanks once again to being a little too eager with the throttle. The third run was great with no problems whatsoever, despite almost spinning again coming back into the pits on those bumps. Choosing to go with the Options, my fourth run saw me break into the 1m 37s bracket for the first time, setting a time of 1:37.340. I couldn’t help but be glad to finally have a decent run on the Options. The first flying lap was unfortunately impeded by traffic, holding me up enough for me to abort the lap. The fifth run, again on the Options, consisted of three consecutive clean and consistent laps, practically a perfect run though unfortunately my time was not improved. The tires worn by the sixth run, it didn’t yield any results so I came in early to grab a new set. My seventh run was fantastic as I was able to put together a brilliant lap on the new tires, reaching a 1:36.986, easily my fastest time of the weekend yet. This secured 7th position for P3, a result I’m immensely satisfied with, even if it took 16 laps to achieve it. With expectations of 20th or higher, my team gave me a rather lenient goal to aspire to for this qualifying session despite the higher places I reached in the various Practice sessions. Confident in my ability to achieve that, I set my own personal goal of 15th, a place I reached easily as… wait for it… I MADE IT INTO Q3! Yes, I made the final qualifying session but I’ll explain that in a second, first my run in Q1. Going with the Options, I went wide at turn 4 on my first flying lap and again on the second, this time at turn 11. My second run, on the same tires, took a total of 4 flying laps to improve my time, setting a 1:37.747 in the process. A time that’s slower than my best on this track but good enough to reach Q2. Sticking with the Options (I used them the entire session), I had an okay initial run putting down a reasonable time but nowhere near my best once again. The second run was much better, improving my time to a 1:37.312 which again doesn’t match my best ever but gave me 10th position, obviously being decent enough to allow me to progress into the final qualifying session. Surprised I had reached such heights -- who would have thought a Virgin would be in the top ten so early in the season, if at all? -- and with worn tires, I decided to not aim for anything and just be content with anywhere in the top ten, even if that happened to be 10th. Easing the pressure by exceeding both mine and my team’s goals, I went into the session noticing instantly how overcast it had become. Rain didn’t eventuate however and neither did a decent time, my second run being hampered by some unfortunate mistakes. I spun out of turn 1 on my out lap due to the cold, worn tires, then went wide at the same turn on my first flying lap, destroying my chance at a better lap due to the session expiring. I ended up 10th but definitely believe that at least 9th was possible if I didn’t stuff up, as I was pipped on that last lap by Petrov. My time was a 1:38.401, perhaps slower than previous ones over the weekend due to the worn tires but still, I think I surprised everyone including myself by reaching Q3, so quite frankly I don’t care. What a fantastic qualifying session! A great contrast to the events in the last round too; I guess I love this Malaysian circuit! Vettel acquired pole, maintaining Red Bull’s insane consistency and dominance so far this season. A tawdry start with far too much wheelspin sent me backwards pretty quick, reaching about 18th place (not actually sure). 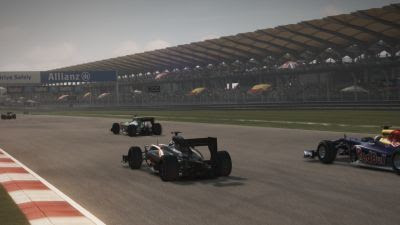 It didn’t matter however as I managed to make it back to 16th relatively quickly, only to spin at turn 4 on the second lap after going far too wide due to missing my braking point while I watched the cars ahead. I really need to work on those starts. Anyway, I recovered right behind my teammate Lucas and got past him on lap 4 after a good little battle, only to throw it away by once again going too wide at turn 9, putting me by myself in the race. Disappointed I pressed on trying to find a rhythm and trying to hit every apex, which I achieved by about lap 11. On lap 13 I was lapped (already) by Webber -- who had the lead -- and not long afterwards his teammate Sebastian Vettel. Because Lucas had pitted I was ahead of him, whilst Trulli -- who also pitted -- came out a few seconds ahead of me. I managed to catch and pass him on the back straight on lap 17 heading into the final turn but stuffed it and had a half spin due to my tires which were worn from the qualifying session yesterday (as I reached Q3 I had to start on the same tires). Probably not surprising as I was already uncomfortable with them. Thinking I had once again fallen behind (but still, surprisingly -- at the time -- ahead of Lucas), I was surprised when my team told me I was ahead of Trulli on lap 19. He must have pitted again or something because I certainly didn’t pass him on the track, unless he had gone off and I just didn’t notice. I entered the pits for some shiny, new, Prime tires on lap 20, feeling very pleased with the idea of disposing of the horribly worn Options. It was hard to get a rhythm after the pit stop though as I kept having to move aside for the frontrunners who were lapping me. On lap 27 it began to drizzle, getting progressively heavier rather quickly. On lap 29 Lucas retired, whilst on lap 32 I passed Vettel who had spun not too long after lapping me once more, clearly due to the wet conditions which were getting quite serious. On lap 34 I pitted for wets, seemingly making the right decision as putting the wets on allowed me to un-lap myself against some of the others who chose inters instead, which felt remarkably satisfying. A few people ahead also pitted twice (once for inters and then again for wets), increasing my position by three to 20th. On lap 41 I almost spun twice due to the intense conditions, the rain really drenching the circuit and leaving it absolutely saturated. On lap 42 as I exited turn 2 I nearly spun again as the exit curb was extremely slippery and induced an incredible amount of wheelspin. I managed to save it but that sent me for a detour into the grass, so it took a while to recover. Later during the same lap, while waiting to be overlapped once again I accelerated too early, spinning again. Because Kubica crashed into me I got penalized, the officials thinking I caused the accident. I thought this was a bit unfair but I chose to do my drive through penalty instantly to get it out of the way. The drive through allowed me to contemplate the wet conditions briefly, the rain seemingly suiting me -- something interesting to note. On lap 44 I was informed that I was in position 19th which was a surprise, must have been a retirement or something. On the same lap I passed Buemi who was facing the wrong way in turn 1, then reached 18th near the end of the lap due to Kubica’s retirement -- probably due to our earlier collision. On lap 48 I caught the first turn’s curb and had a half-spin, Senna hitting me despite me being off the racing line, only minor damage though. Lap 52 saw me reach 17th, where I was also destined to finish, 1 spot ahead of my team’s expectations. Despite some mistakes and the black flag, I’m pretty happy overall with the race though do wonder what could have been had things gone a little differently. 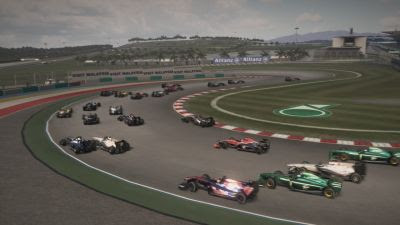 Webber won with Alonso and Hamilton in second and third respectively, whilst my team Virgin overtook Lotus for 11th in the constructors’ championship. I still need to work on my starts and consistency but overall the race was much better than my first two, the rain being a welcome addition to the weekend overall thanks to the chance to practice, as well as the conditions seemingly suiting my driving style. Perhaps ironic given the silly spins I sometimes have, but I won’t object nor complain if it means I continue to improve or have better weekends. The race wasn’t perfect but I’ll take the result, ecstatic with reaching Q3 and content with the idea of the weekend outclassing Bahrain and Australia. It leaves me feeling confident as we head into the next fly-away round, this time in Shanghai, China. Bring it on.